With a yearly influx of a wide variety of pelagics, the Sea of Cortez and in particular La Paz offers world class spear fishing. Enjoy the thrill of catching marlin, yellowfin, yellow tail and dorado with some of the most experienced fishermen as your guides. Spend a couple of days doing whatever takes your fancy. 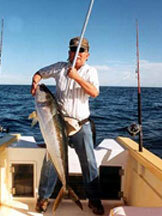 Indulge in a choice of sport fishing in a Super Panga, snorkeling, free diving or just relax on a quiet beach. Mosquito fleet has been providing world class sport fishing in La Paz, Mexico since 1984, longer than any other local fishing fleet. We have offered to our clients the ultimate in service and quality; we also have the most knowledgeable captains and finest crew to make your trip the most enjoyable in Baja. Please surf our site and take a look at the crew, boats and fish reports that are available to assist you in having the Yellow Tail catch in the Sea of Cortez most rewarding fishing trip possible. Our goal is to get you to the best fishing grounds as well as have the best fishing tackle available for the job so you can land the big ones. These new 26′ super pangas add a whole new dimension to open panga fishing. Equipped with diesel power and a w.c, they deliver comfort and reliability without giving up the feel of open panga fishing. 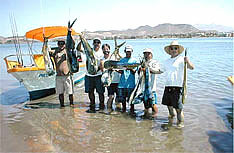 Spearfishing in La Paz is one of the most challenging yet rewarding activities in the Sea of Cortez. With a yearly influx of a variety of pelages, the Sea of Cortes and in particular La Paz offers world class spearfishing and boasts a number of IBSRC records.